I’d always vaguely expected to outgrow my limitations. One day I’d stop twisting my hair, and wearing running shoes all the time, and eating exactly the same food every day. I’d remember my friends’ birthdays, I’d learn Photoshop, I wouldn’t let my daughter watch TV during breakfast. I’d read Shakespeare. I’d spend more time laughing and having fun, I’d be more polite, I’d visit museums more often, I wouldn’t be scared to drive. Doesn’t that grab you immediately and make you say, “Yes, me too!”, substituting your own particulars for “twisting my hair” and “Shakespeare”? Over a period of twelve months, Rubin set out to become happier in the key areas of her life, including marriage, work, money, and friendship. She sought out the wisdom of ancient philosophers, the latest scientific research, and the sound advice of her friends. 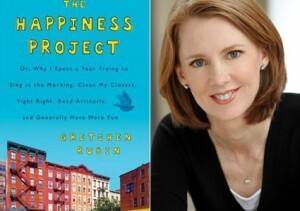 In The Happiness Project, she recounts her experiences, the successes and failures and ways that she changed. Why does it often seem more tiring to go to bed than to stay up? Inertia, I suppose. Plus there’s the prebed work of taking out my contact lenses, brushing my teeth, and washing my face. Rubin has provided the most motivation yet for me to write the Reschool Yourself memoir. Reading something that I could have written, if only I’d had the right words, makes me feel deeply understood and relieved that I’m not alone. It gives me hope that I can change in the ways I want to, just like she did, equipped with the tools to make that happen. I want to give my own readers the same gift. What have you read that makes you feel deeply understood?